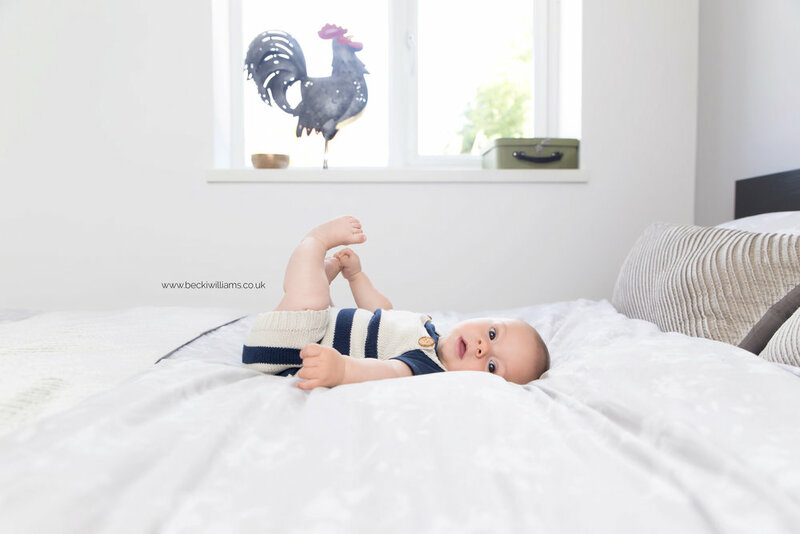 I first met Enzo in January when he came to me in Hemel Hempstead for his Newborn Photo Shoot. As always, time flew by and before we knew it he was booked in for another photo shoot at 6 months. For his Baby Photo Shoot I travelled to Edgware where I took some lovely relaxed images around his home with his mum and dad. Lifestyle shoots like this are the perfect way to capture special moments in the home where he grew up. Enzo’s family are just about to move house, so they will now always have these pictures to look back on where he spent his first year. We started with cuddles in the living room with both mum and dad. Just look at that gorgeous grin! I love taking photos in cots and on big beds. It’s a great way to show just how tiny he once was. It won’t be too long before Enzo is using these bars to pull himself up to standing. Mum and dad had to of course get in on the cuddle action on the bed as well! If you’d like any more information about Baby Photography or would like a Photo Shoot like Enzo’s, please Get In Touch!